Canadian Prime Minister Justin Trudeau is taking his pro-trade message directly to Americans. Mr Trudeau emphasised the benefits of Canada-US trade on jobs and the economy in an interview with NBC News. It is a well-worn message for Mr Trudeau, but one he is keen to promote before North American Free Trade Agreement talks launch. Mr Trudeau spoke to the network from New York as he attended Canadian show Come From Away on Broadway. The musical production is based on the true story of how the small town of Gander, Newfoundland, welcomed some 7,000 air travellers stranded in the days after the 9/11 terror attacks when the US closed its airspace. It recently opened in New York City after a successful run in Canada, and its heart-warming storyline was the perfect medium to help transmit Mr Trudeau's message of the importance of the longstanding ties between the two countries. In remarks before the show, Mr Trudeau said: "We have a friendship between our two countries that are like no other". His press secretary said on Thursday that "we embrace the opportunity to highlight how we are there for each other in times of need". 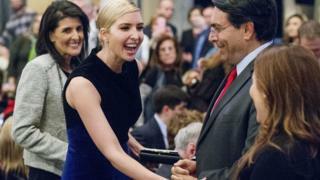 The audience on Wednesday was filled with political glitterati, included Ivanka Trump as a guest, who sat near to UN ambassador Nikki Haley and Mr Trudeau and his wife Sophie Gregoire Trudeau during the evening's entertainment. Mr Trudeau and Ms Trump had met previously when she helped host a summit on women business leaders and entrepreneurs when the Canadian prime minister visited Washington earlier this year. Mr Trudeau told NBC's Tom Brokaw that there is an opportunity to improve the North American Free Trade Agreement (Nafta) in trade talks. US President Donald Trump wants to renegotiate Nafta, a 1994 trade deal that includes Canada and Mexico. In February, the president said the trade relationship between the two countries only needed "tweaking" - a word Mr Trudeau clearly remembers. "(Nafta) has led to a lot of great jobs for a whole lot of people on both sides of the border and I very much take him at his word when he talks about just making a few tweaks," he told the network. "Because that's what we're always happy to do." Trade relations with the US are crucial for Canada and Mr Trudeau and his ministers have repeatedly hammered home statistics over the past few months that underscore the importance of Canada to American commerce. Nearly nine million US jobs depend on trade and investment from Canada, while Canada is the top customer for 35 US states. US Commerce Secretary Wilbur Ross is expected to trigger notification to the US Congress to start the Nafta renegotiation by the end of March.